On this trekking holiday in Patagonia explore the spectacular mountain areas of Fitz Roy and Torres del Paine. Trek through the heart of Los Glaciares National Park to the magnificent Fitz Roy Massif, and hike the 'W Trek' from Lago Grey to the iconic Paine Towers. Join trip in Buenos Aires and check-in to our hotel. Here we find ourselves in the midst of Argentina's capital, located on the southern shores of the Rio de la Plata. Since its founding by Pedro de Mendoza in 1536 the city has thrived on trade and its vibrant streets are filled with an eclectic mix of European architectural styles, with Spanish, French and Italian classicism rubbing shoulders with remnants of Victorian grandeur. After gaining independence from the Spanish in 1816 the city grew to rival the great cities of Europe, its wide avenues and elegant squares earning it the title of the Paris of the South. This afternoon you could explore this lively city, you may also choose to wander the city streets, admiring the impressive architecture and relaxing parks, or enjoy the traditional Porteño pastime of people watching from the many sidewalk cafés. We leave the city far behind as we fly south to Patagonia and the town of El Calafate, the gateway to Los Glaciares National Park. From here we travel approximately three hours to El Chalten, the charming village close to Fitzroy and Torre Massif. After checking in to our hotel you may wish to explore some of the nearby short trails to local sites and viewpoints, such as Chorrillo del Salto Waterfall and Condor or Eagle lookouts. Please note: If the group is six people or less the bus journey to El Chalten will be by public bus. After an early breakfast we drive to El Pilar, the starting point for the classic trek to Laguna de los Tres. Taking just what we need overnight we ascend for two hours up a gentle slope with fantastic views over the Fitzroy Massif and Piedras Blancas glacier. On reaching the Poincenot area we stop briefly at our campsite (750m) before continuing to Rio Blanco Base Camp. An hour of steep ascent takes us to De Los Tres Lagoon (1180m), the emerald small lagoon at the foot of Mount Fitzroy, where we will have the opportunity to appreciate the enormous granite walls of Fitzroy and its nearby peaks, Poincenot, Saint Exupery and Guillaumet. After exploring the area around the lagoon, we descend back to our campsite to spend the evening inside the forest. An additional hike to Capri Lagoon is available for those wanting to do more walking. Today's 10 kilometre trek is expected to take around six hours with 700 metres of ascent and descent. The additional optional walk takes three hours and covers another six kilometres. After a camp breakfast we set out for another days hiking through the unique landscape of Los Glaciares National Park - taking the Madre e Hija Trail which links the Fitzroy and Torre Valleys. We walk passed two clear lagoons and through 'Lenga' forest on our way to Torre Lagoon, from where weather allowing, we will be rewarded with stunning views to Torre Massif and the surrounding glaciers as we have our picnic lunch. Later we continue our trek along Torre Trail back to El Chalten. Today's 18 kilometre trek is expected to take around seven hours with 300 metres of ascent and descent. This morning there is an optional excursion to Lago Del Desierto, where you will enjoy a scenic drive to the lake, followed by a short sail across the lake and a hike up to the Vespignani Glacier lookout. In the afternoon we travel back to El Calafate, where we spend the night. Please note: If the group is six people or less the bus journey to El Calafate will be by public bus. Today we travel for approximately six hours by public bus south to Puerto Natales, crossing the border into Chile en route. Puerto Natales is a small fishing port with a rich history as a meeting point for merchants and Patagonian pioneers. Later that day we have briefing with the Tour Leader and the local trekking guide on the 'W' Trek, and have the rest of the day to prepare for the trek and explore the town. After breakfast we drive from Puerto Natales to Torres del Paine National Park (approximately an hour and a half). We continue along the winding roads of the park to the Grey Lake area, with great views to 'Cuernos del Paine' en route. Arriving to the lake we start our hike to Ferrier viewpoint. This can feel a demanding ascent but the views over Torres del Paine National Park - of the mountains and glaciers of Paine Grande and Los Cuernos Massif, are stunning. Later we take the ferry across Grey Lake to Grey refuge campsite (approximately one hour). The campsite is magnificently located between the lake and forest, close to Grey Glacier, we can make the short hike (two kilometres) to the glacier viewpoint. Today's six kilometre trek is expected to take around four hours with 350 metres of ascent and descent. From Grey refuge we start our trek along the first leg of the 'W' circuit, walking by Grey Lake and crossing the beginning of French Valley, where we will spend the night. The trekking is fairly relaxed, passing through striking mountain and lake scenery to the Frances Domes refuge campsite. Today's 21 kilometre trek is expected to take around eight hours with 300 metres of ascent and descent. We start early today for our trek along French Valley. As we walk along streams and the main river, if we are lucky we may see glacier breaks from Paine Grande to our right.There are some short steep climbs as we arrive to the main lookout point at Britanicos camp - to see the great granite amphitheatre and all its peaks revealed. We will also see other trekkers here as this is a popular area for walking. Later we return back down the central part of the 'W' to Frances Domes for a second night. Today's 17 kilometre trek is expected to take around seven hours with 550 metres of ascent and descent. Today's trail is known as Sendero Paso Los Cuernos, due to the fact that it passes under the dramatic mountains known as 'Los Cuernos' (horns). We walk alongside the shores of the beautiful Nordenskjöld lake, crossing small rivers and wide grasslands along the way. 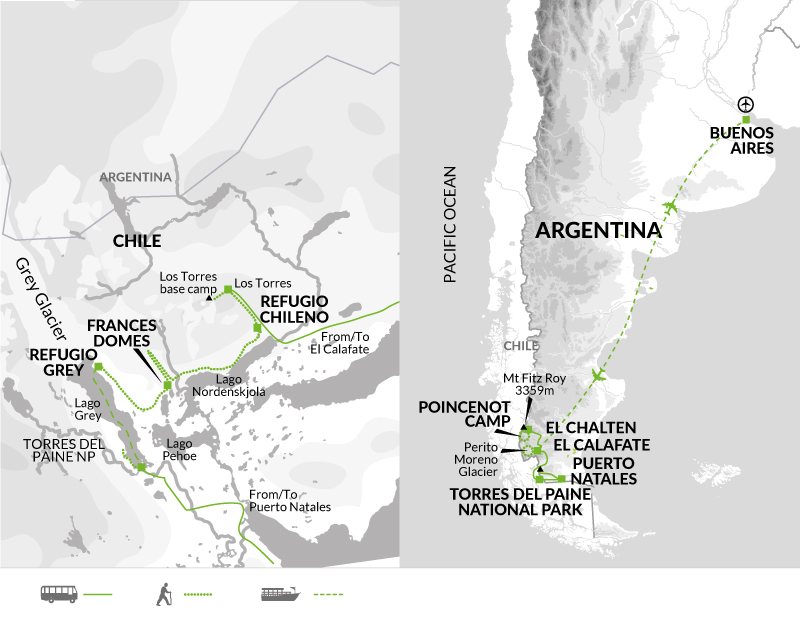 We continue our trek to Chileno refuge campsite. Today's 19 kilometre trek is expected to take around seven hours with 500 metres of ascent and descent. Our final day of trekking takes us to the foot of what has inspired us over the last week - the impressive granite towers of Torres del Paine. Climbing steeply, high above the scattered blue lakes, we hike along the Asencio river, and up towards the Torres. After a final clamber over steep terminal moraine deposited by a glacier centuries ago, we reach a panoramic point from where we admire one of the best known sights of Patagonia, the Paine Towers, rising very close, above a green lagoon. The famous Torres del Paine (2900m) consist of three gigantic granite monoliths, overlooking a landscape shaped by the forces of glacial ice and the elements. Again this is an iconic walking area so we will see other trekkers here. On returning to Las Torres we travel by charter bus via Cerro Castillo pass back into Argentina and to El Calafate. Today's 15 kilometre trek is expected to take around six hours with 600 metres of ascent and 800 metres of descent. Today we make an excursion to Perito Moreno Glacier - an eighteen mile long, three mile wide ice river ice river towering an average of 60 metres above the surface of the lake water, a truly impressive sight. There is also the option of ice trekking (maximum age 65). This morning we leave the wilds of Patagonia behind and step back into the heat and bustle of Buenos Aires. We arrive late afternoon, and have the rest of the evening to enjoy the city. Our trip ends after breakfast in Buenos Aires. Bring light and comfortable clothing that can be layered according to the temperature. The weather conditions in the mountains can be changeable, and it can become cold, especially at night, so bring warmer layers. Tops made from wicking materials which keep you drier and are recommended as a base layer, and walking trousers are preferable to trousers of heavier material such as jeans. A waterproof jacket is essential at all times in case of rain and wind. - Thermal underwear: Comfortable around camp and much more practical (and warmer) to sleep in than pyjamas. You will need to take one main piece of baggage and a daypack. Your daypack should be at least 30 litres capacity. During the course of a trekking day, you will not have access to your trek kit bag, which is being carried for you by the porters. In any mountain region the weather can change rapidly and you must be equipped for this eventuality. Your daypack should be large enough to carry your day things including: waterproofs, fleece, long trousers (if walking in shorts), warm hat and gloves, sun hat, suncream, water bottle(at least 1 litre bottle), tissues and your packed lunch. Camera equipment can be heavy so think carefully when deciding what to take. Please note that in the Fitzroy area you will also be carrying your overnight things for two days / one night. In Torres del Paine your main bag will stay at with our local ground suppliers and you will be given a trek kit bag in which to put your kit for the W circuit. Your trekking clothing and equipment should be packed into the kit bag which is to be carried by local porters. In Puerto Natales there is time to re-organise your luggage, the weight limit for this is 5kg and advice on how to pack will be given at the trek briefing. The baggage limit for the internal flight between Buenos Aires and El Calafate is 15kg. If you exceed the limit you are able to pay for the excess locally at the airport, this is approximately $20. - High factor sun cream: Patagonia is very near the ozone layer hole. A combination sunblock/lipsalve is ideal for facial protection. - Personal first aid kit - On each walk a first aid kit is carried but you should have your own blister kit, supply of plasters, aspirin and other essentials. - Waterproof Cover for Rucksacks: Can be useful to offer extra protection for your bags against rain. Accordingly, you should allow US$60 for tipping. Day three at Poincenet Camp shared two-man tents are provided, along with sleeping bags and mats. There is also a kitchen tent, dining tent and a latrine. However there is no running water at this camp location so washing facilities are limited. It can also get very cold so bring warm clothes. When camping at the refuges on the W-Trek shared two-man tents are provided (and pre-erected), along with sleeping bags and mats. You will have use of shared bathroom facilities with hot water showers (separate communal shower blocks for male and females) and use of the communal dining room at the refuges, where meals will be taken. Meals are held at fixed times and there is a small shop selling basic items. The refuges have electricity and heating, there are plugs to charge devices however these are often used first by the hikers staying the dorms. In high season the refuges can be very busy. 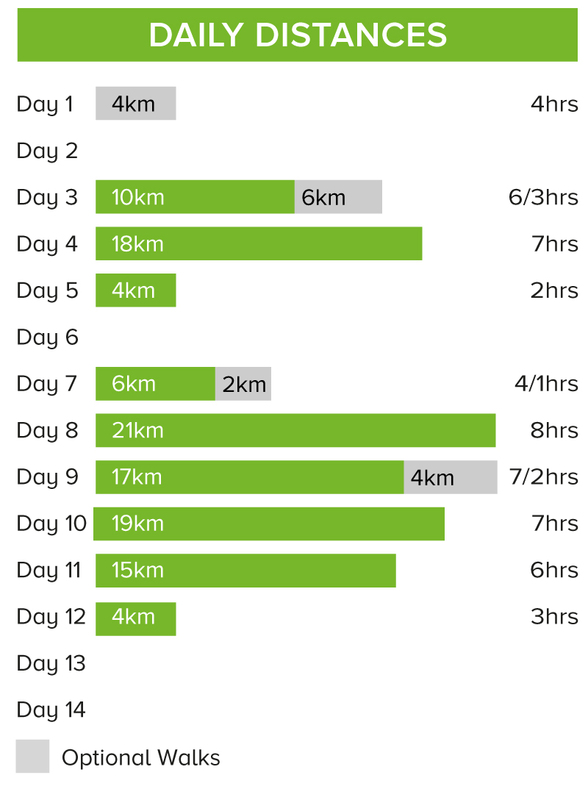 Trek on 9 days for between 2 and 8 hours. Maximum altitude of 1,200m.